We are sprucing up our newsletter to keep our regular users up to date with what is happening in our world in a more attractive way. 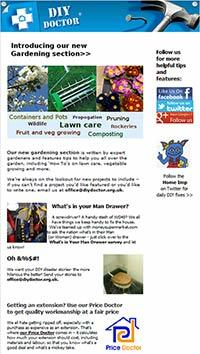 Our newsletters have proved very popular with our readers and we send them out once a month to highlight all the changes to the site, DIY and building news, and anything else we think you would like to know. We will also be starting to offer competitions (with prizes!) and quizzes. So if you are not yet signed up and would like to receive our monthly news letter then please click through to sign up. It is easy to subscribe and unsubscribe and we will not bombard you with spam, or share your information around to others.